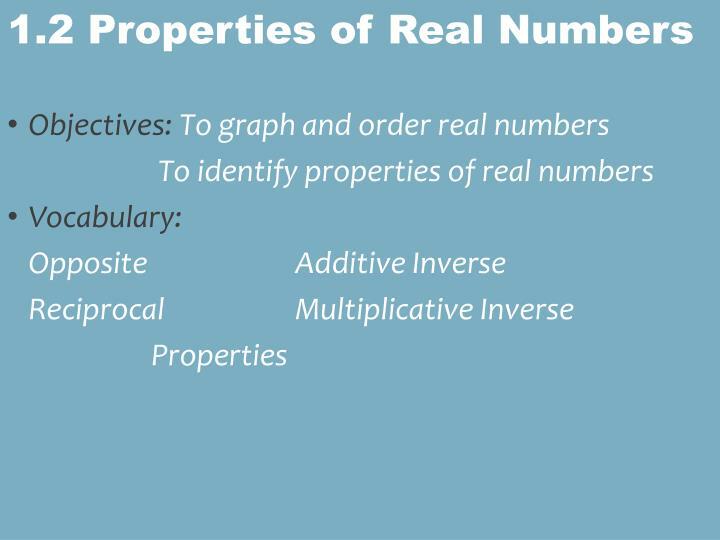 Objectives: To graph and order real numbers To identify properties of real numbers Vocabulary : Opposite	Additive Inverse Reciprocal	Multiplicative Inverse Properties. 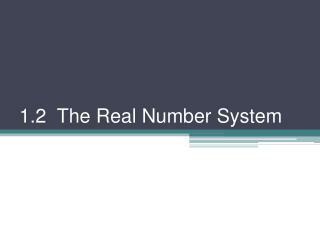 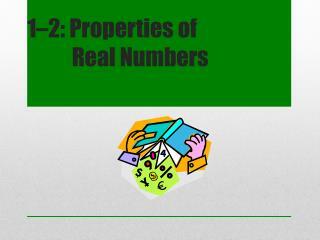 1.2 Properties of Real Numbers. 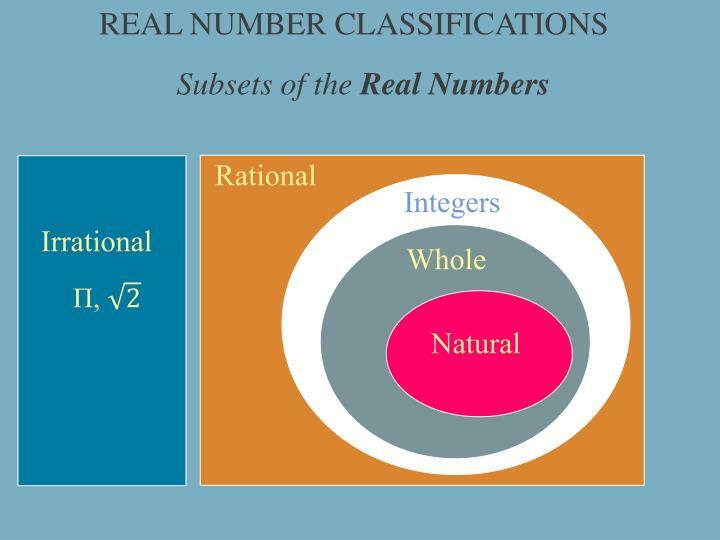 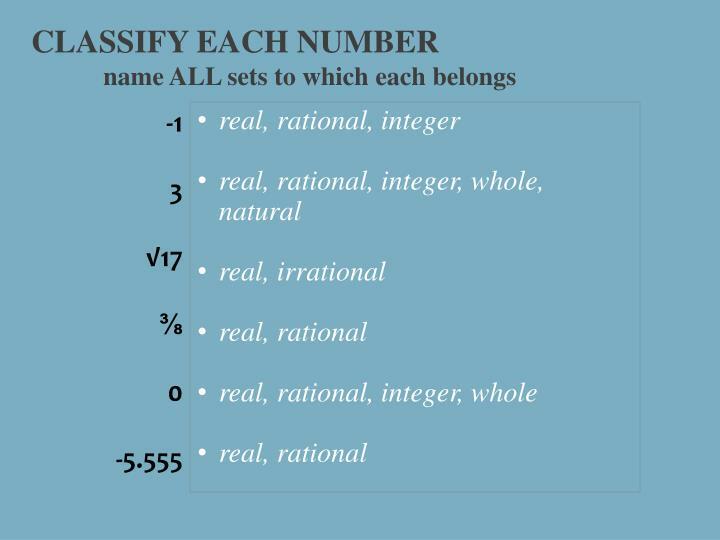 Rational numbers are all numbers that can be written as a quotient of integers. 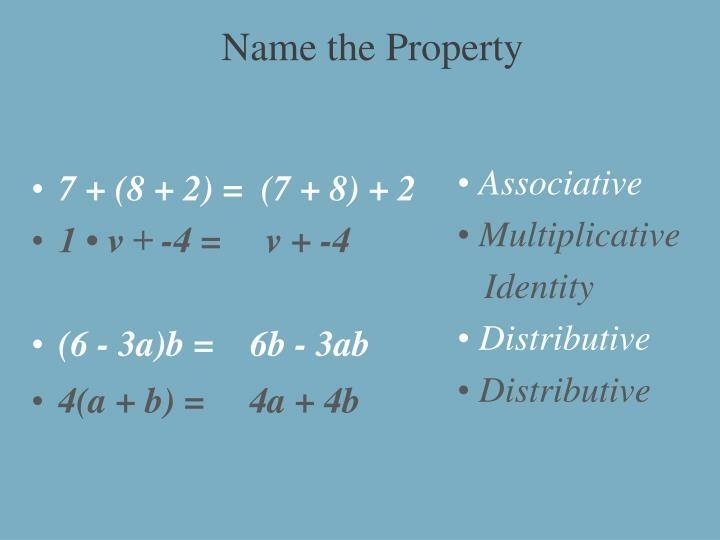 a/b, b≠0. 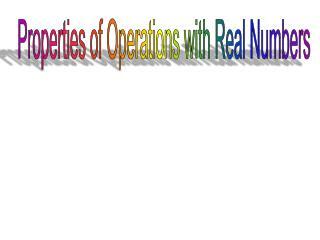 Deals with ORDER. 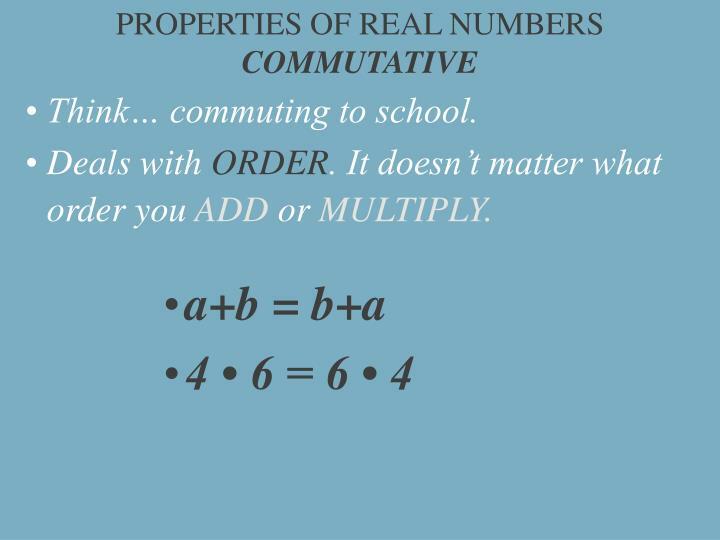 It doesn’t matter what order you ADD or MULTIPLY. 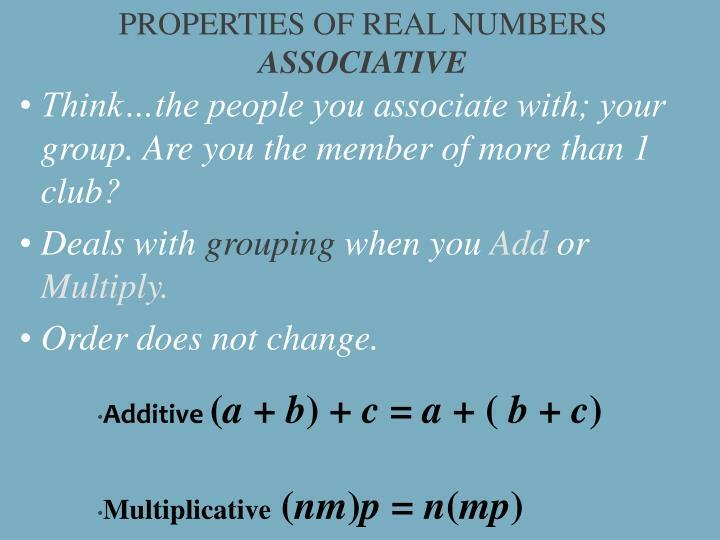 Think…the people you associate with; your group. 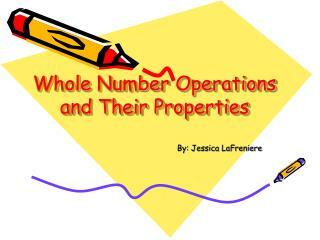 Are you the member of more than 1 club? 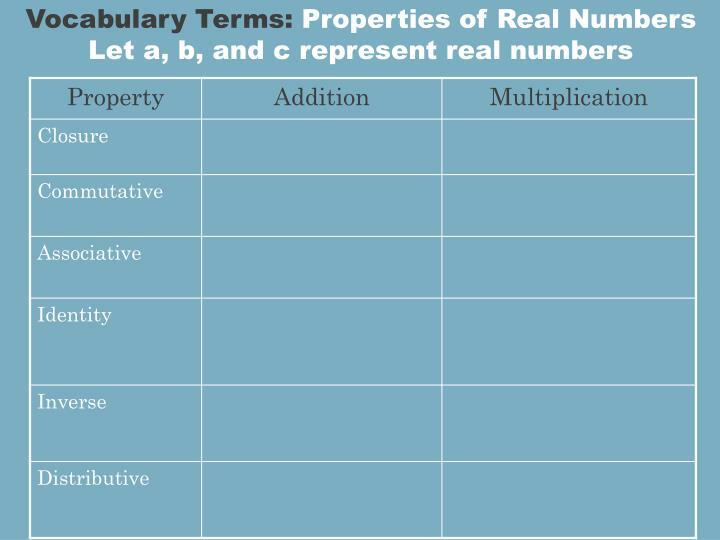 Deals with grouping when you Add or Multiply. 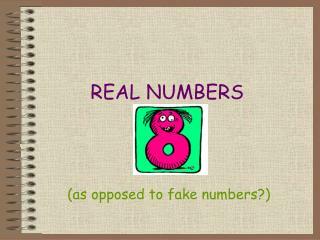 1.3 Exploring Real Numbers -. 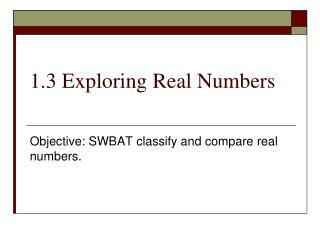 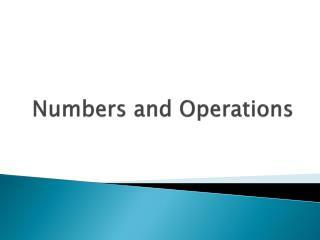 objective: swbat classify and compare real numbers. 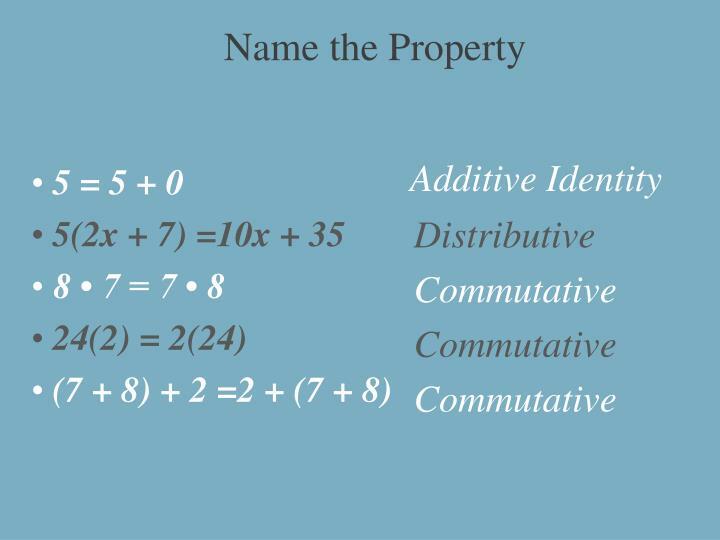 mini quiz 3. 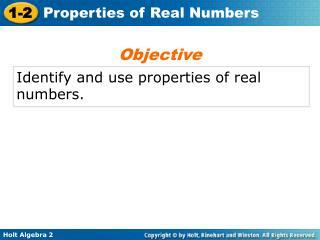 1. evaluate	when b = 4 and h = 6. 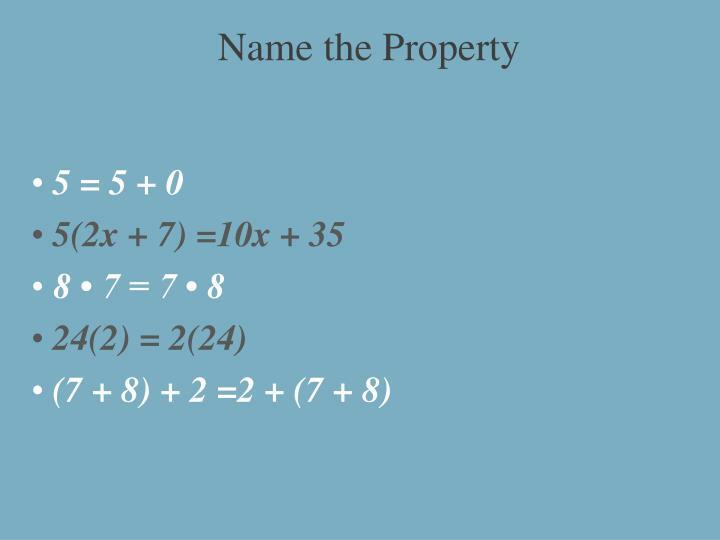 (make sure to reduce your answer) 2. for the order of operations, do you add first or subtract first? 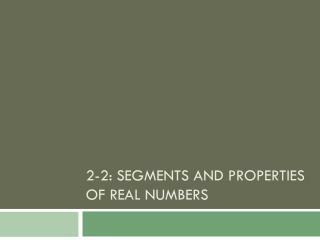 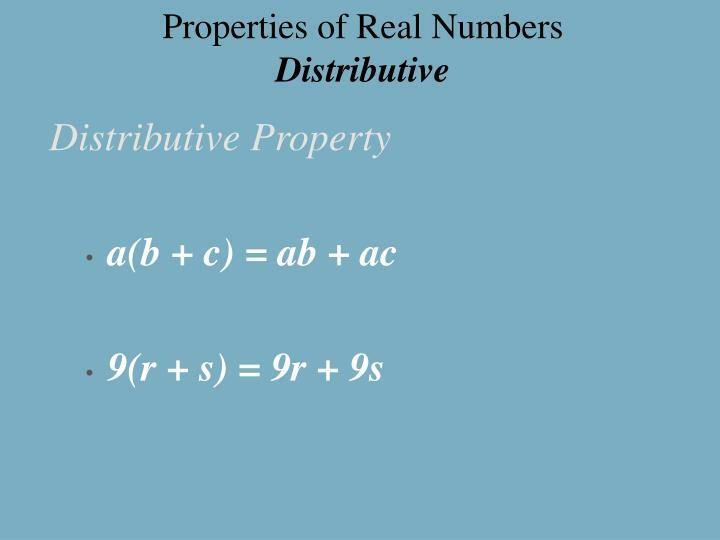 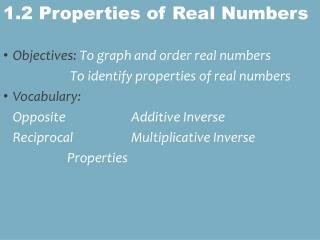 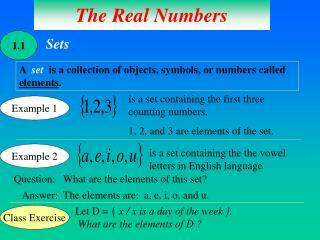 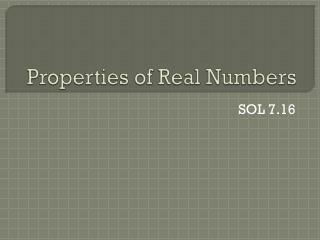 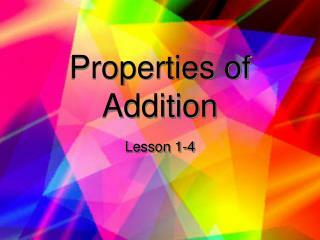 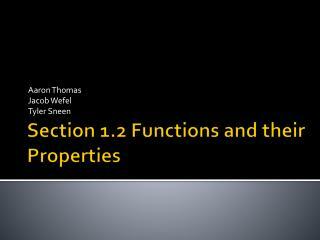 Properties of Real Numbers -. 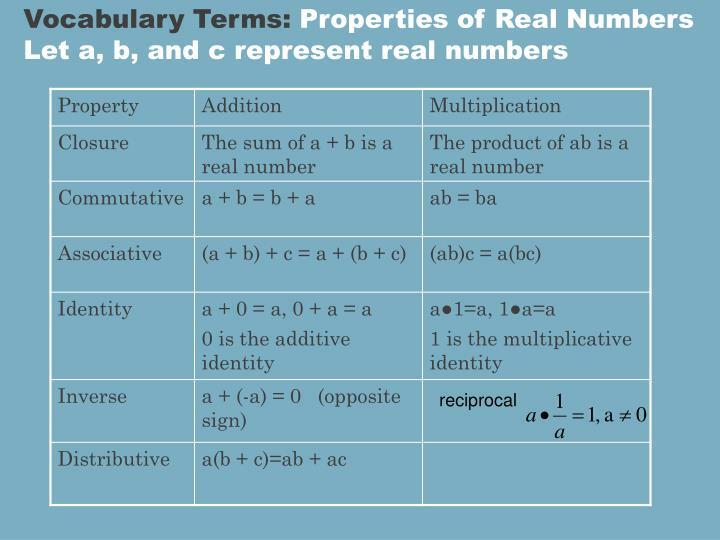 sol 7.16. vocabulary. 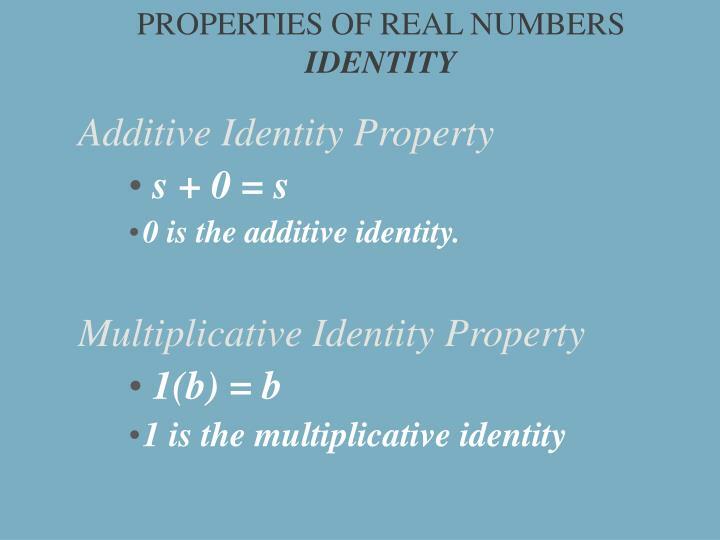 addend : a number that is added to another . 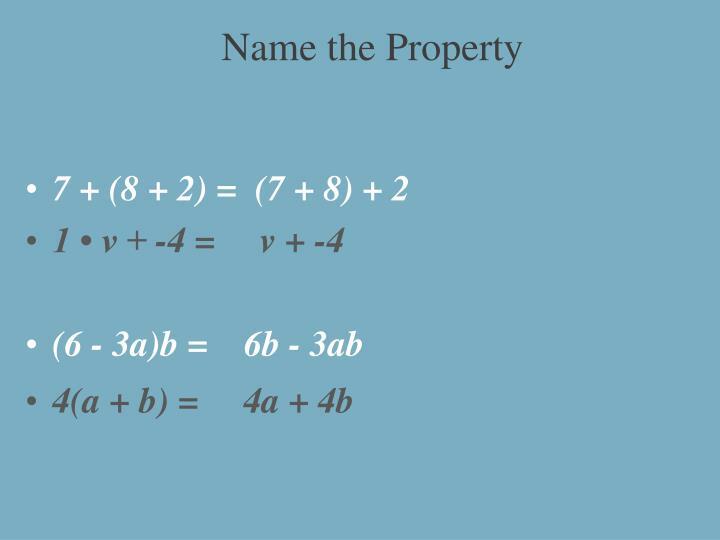 sum : the answer to an addition problem. 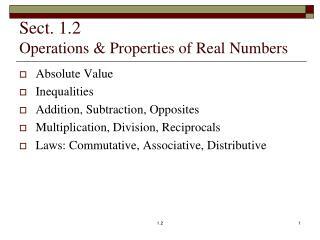 factor : a number that is being multiplied . 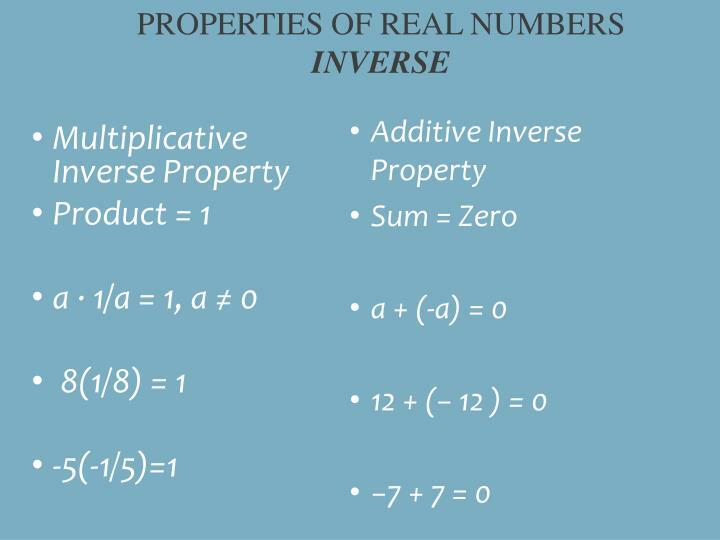 product : the answer to a multiplication problem . 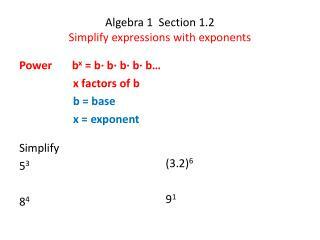 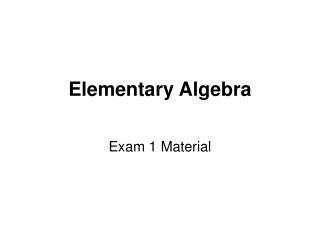 Algebra 1 Section 1.2 Simplify expressions with exponents -. 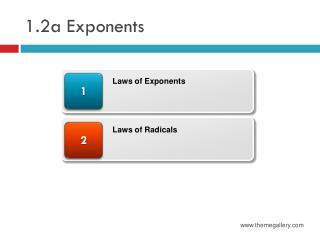 power b x = b∙ b∙ b∙ b∙ b… x factors of b b = base x = exponent. 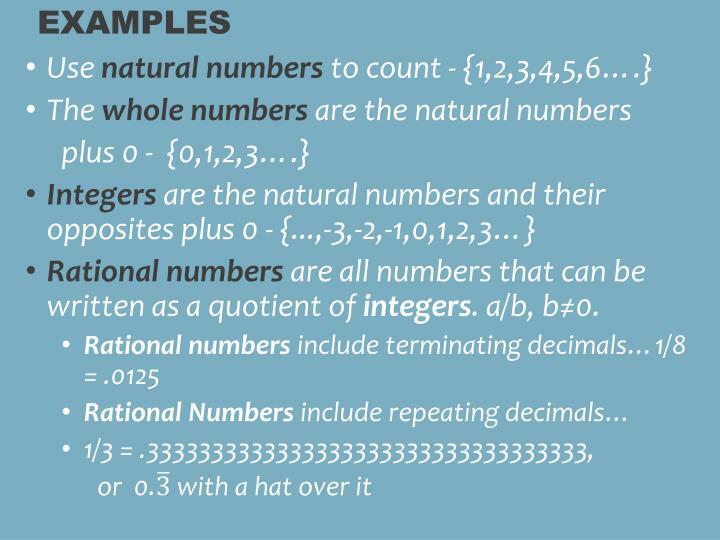 (3.2) 6 9 1. simplify 5 3 8 4. write in exponential form. 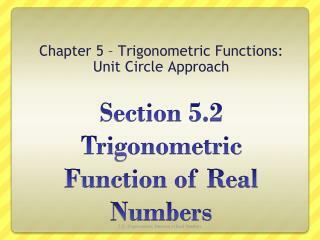 Section 5.2 Trigonometric Function of Real Numbers -Chapter 5 – trigonometric functions: unit circle approach. 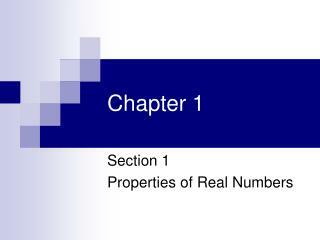 section 5.2 trigonometric function of real numbers. 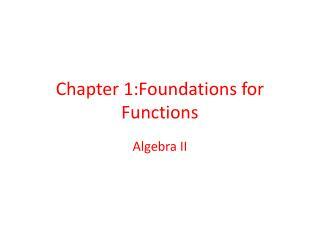 definition of the trig functions. 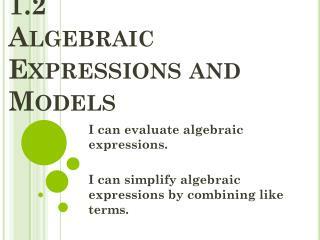 example – pg.